Create a lasting impression by hosting your next event at the Hyatt Regency Orange County. Their expert staff of seasoned professionals is dedicated to providing the highest level of customer service and their attention to detail will be evident in every aspect of your program. Located near Disneyland and the Anaheim Convention Center. Costa Mesa Marriott offers 3,200 square feet of event space highlighted by the ballroom which is perfect for weddings and special events of up to 120 guests. 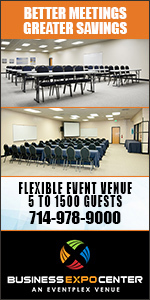 For smaller, more intimate functions, we offer two excellent breakout rooms. Whether you are traveling for business, pleasure or planning an event, the Costa Mesa Marriott Hotel will exceed your expectations. Discover Costa Mesa's largest hotel with over 50,000 square feet of flexible meeting space complete with 30 breakout rooms featuring two outdoor private terraces. From 5 to 1,200 guests, let our onsite conference service staff and audio visual team collaborate in exceptional menu selection and innovative event technology. We offer the perfect space for your group, coupled with an incomparable level of service to supersede the greatest of expectations. Our conference facilities are flexible enough to meet the needs of both small businesses and large corporations, from an boardroom meeting to a conference for hundreds of people. Over half of our meeting rooms feature views of South Coast Plaza Park or the pool/waterfall area. High Speed Internet Access is available in all meeting rooms and your audio-visual needs will be met quickly and professionally by our Presentation Services company. A dedicated, highly trained Executive Meeting Specialist will be at your side throughout your event, ready to help with anything you and your guests need. With more than 100,000 square feet of flexible indoor and outdoor function space, stunning ocean view ballrooms and a full range of conference services, this is the must book venue for meetings. The resorts conference center is located at the West End of the property and includes its own porte cochere and lobby. Whether your planning a special occasion such as a Birthday, Anniversary, Company Party or other Business event, Moreno's Restaurant has the Banquet Facilities to accommodate your needs. Held in their 124 year old Quaker Church (remodeled with a touch of Mexico), this historical landmark can accommodate up to 175 people (up to 200 without dance floor). Banquet Hall is equipped with a full service bar, P.A. System, pull down 8 Ft. screen and a large stage that can accommodate a D.J. or band. Hosting a large corporate event to a smaller meeting at the Marconi is a partnership you can rely on to deliver a unique experience, high-end service and top quality food. Recognize your coworkers and employees, impress clients, hold a summit meeting, and much more. When you put your trust in us, your business associates will leave with a positive lasting impression. Located in the foothills of Yorba Linda, Black Gold Golf Club boasts a professional corporate boardroom that can host up to 16 guests. Featuring a large conference table, comfortable chairs, multiple phone lines, conference phone, and high-speed wireless Internet access. The boardroom is a comfortable alternative to the stuffy confines of the home office. Break the monotony of a typical meeting and enjoy some golf immediately following your session. Food and beverage service is also available. Located on a bluff above the Dana Point Harbor, their facilities can accommodate a small group meeting or special event. Offering complete package of services to ensure the success of your meeting or event - whether your gathering is for 6 or 40. Perched atop dramatic bluffs overlooking the lovely Dana Point Harbor, the Laguna Cliffs Marriott Resort and Spa offers 50,000 sq. ft of flexible indoor and outdoor event space including the newly renovated Pacific Learning Center with tiered amphitheater seating and a highly sophisticated multimedia presentation system. Set a loftier goal for your next corporate event. Situated high atop a dramatic oceanfront bluff in Southern California, The Ritz-Carlton, Laguna Niguel raises the standard for meetings and business functions - with award-winning facilities that pair ideal meeting venues with impeccable service. From exclusive board sessions to product launches or company-wide celebrations, we ensure all your events are memorably excellent. Discover the many signature features of the premier meeting hotel in Southern California. For your Orange County, CA business needs, allow us to host your meeting or social event in any of our 25 Irvine event rooms. Boasting 27,000 square feet of flexible and elegant meeting space, the Irvine Marriott Hotel is perfectly suited for all types of weddings, social, or corporate events. Our newly renovated lobby is the ideal location for seamless small business and social gatherings. Montage Laguna Beach offers a relaxing yet elegant ambiance which is ideal for corporate meetings or social gatherings. With 14,500 square feet of meeting space Montage can accommodate groups of all sizes. Meeting facilities include oceanfront lawns, lush gardens, lavish restaurants, and opulent ballrooms which are awe-inspiringly appropriate for meetings of any theme or scope. Meals are custom-created by a skilled team of Master Chefs. With our hillside terrace, a perfect setting for intimate cocktail receptions and wedding ceremonies, and our Media Lounge, the ultimate location for wedding receptions, parties, new product launches, sales meetings, awards ceremonies, fundraisers, exhibitions and performances. [seven-degrees] accommodates innovative special events staffed by our team of experts in the "art of entertaining". Attention to detail at [seven-degrees] is unmatched, including full-service planning, design and production; from catering and beverage services to florals and décor to our extensive A/V and lighting capabilities. We make every event a unique work of art! An upscale, fully private venue for all of your corporate events for up to 100 people. This boutique winery specializes in corporate events & custom labeled wine. The perfect place for team building and business events where you can enjoy wine tasting or personalize the wine with your own custom wine labels, featuring a photo, special message and/or company logo. 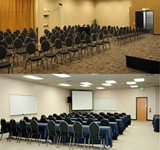 Their 780 square foot Meeting Room can accommodate up to 55 people for a variety of events in Newport Beach. This versatile room can be set up in classroom style, banquet style, and boardroom style and can be portioned for small, private meetings. Located just minutes from the Anaheim Convention Center and Orange County Airport, meeting up with colleagues and friends is a breeze. Providing a team of dedicated professionals who goes above and beyond conventional service. With over 20,000 square feet of meeting and banquet space, their facilities provide an atmosphere conducive to memorable Newport Beach events. Our Marriott Newport Beach Bayview conference space totals 3,200 sq. ft. and is divisible into 5 meeting rooms, or for a unique outdoor event space choose our scenic courtyard. All meeting facilities include audio visual equipment and expert support staff. Guests will enjoy our convenient location near the John Wayne Airport and Orange County Beaches. Located midway between LA and San Diego, the Casablanca Inn is just two blocks from San Clemente's North Beach. The modern meeting room is perfect for simple business meetings, in-depth seminars, or multi-day conferences. Facility is equipped with a digital projector and screen, along with a podium, white board and easels making it suitable for all manner of business presentations. High-Speed WiFi and wired Internet ports make it easy to connect to presentation materials from your PC. And for the comfort and enjoyment of your guests, complimentary coffee and water service is provided. Business travelers appreciate the proximity to Orange County's John Wayne Airport and Camp Pendleton, plus the first-class executive-style accommodations and amenities. Complimentary high-speed wireless Internet is available throughout this newly renovated San Clemente hotel, plus attendees enjoy a well-equipped business center, group travel discounts, and 2,400 sq. ft. of elegant meeting and banquet space available in a variety of layouts to suit your meeting or event. Off the 5 freeway and close to historic downtown San Juan Capistrano, this Inn offers accommodations and a new State-of-the-Art Conference Center which includes: 2 Widescreens, 8 Monitors, and dedicated modem lines. Located just blocks away from the Mission San Juan Capistrano, the El Adobe offers an artfully restored historic setting, as well as a full range of services for your next event. Offering a full range of services with many rooms to choose from.